People who are hard of hearing or are deep sleepers often find standard alarm clocks not very effective at waking them up. A good solution is to buy a vibrating alarm clock. These types of clocks come with a device that you put under your bed, your pillow or you can wear as a watch. When it is time to wake up, it vibrates, and the alarm goes off. Most of the vibrating alarm clocks also come with extra loud signals and lamp flashers. 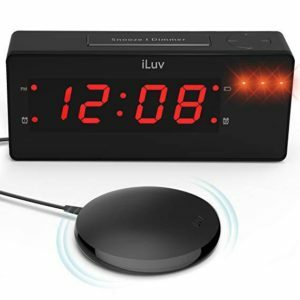 Vibrating alarm clocks are also an excellent option for anyone who has to wake up without disturbing others. There is a wide variety of vibrating clocks on the market; the following is a comparison chart of some of the bestselling and top rated products you can buy. For consumers, there are some things that you should keep in mind when choosing a clock. These include the power source, the loudness of the alarm, the strength of the bed shaker and many other things. Bed Shaker– Vibrating alarms come with a bed shaker that you place under your mattress or pillow. When the alarm goes off the shakers will vibrate your mattress or pillow to wake you up. It is a very effective way for people with hearing loss to wake up. The shaker is small enough to fit under your pillow and vibrates at a set time to awaken you. Couples and roommates can take advantage of the shaker to wake up discreetly. Heavy sleepers and those who are hearing impaired can use the shaker in conjunction with an audible alarm to ensure they wake up on time. Lamp Flasher – Some clocks have an option to plug a lamp into an outlet at the back of a clock or at the end of a cord, when the alarm goes off the lamp will flash or many have a light flasher built into the unit. Power Source- While most vibrating clocks are one that you plug into an electrical outlet, you may want to ensure that any model you choose also has a battery backup in the case of a power outage or if you will be using it while traveling. Time Display If you wear glasses or have a visual impairment you may want to consider products that have a large, bright LED or LCD. Conversely, if you are someone who is bothered by a bright display, some products allow you to change the brightness or that dim the screen while you are sleeping. Snooze Button – A snooze button is a pretty standard feature on most alarm clocks but you may want to check the length of the snooze delay and whether you can program it. PROS: Extremely loud ringer 113 dB, built-in red flashing alert lights, battery backup, 12-volt bed shaker. CONS: Some complaints about customer service and the quality of the device wasn’t what some users expected. The shaker is so powerful it may wake up a partner if you are sharing a bed. 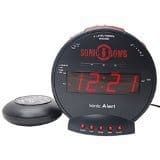 Need to Know – Sonic Alert (the company that makes the Sonic Boom) pretty much have a lock on the vibrating alarm clock market. They have some choices that are great options if you are looking for a LOUD vibrating alarm. What users love: This alarm will scare the pants off you it is so loud, it will wake up even the deepest sleeper. If you have a hard time waking up or if you have a kid that doesn’t like to wake up, this alarm will shake them out of bed. It is easy to use, and tiny and compact, so it doesn’t take up a lot of space on your bedside table. The vibration from the shaker is powerful to help shake those heavy sleepers out of bed. What could be improved: A few reviews have mentioned that the clock has some trouble keeping accurate time, in particular, it jumps ahead, and you have to adjust it every few weeks. Suitable for: Deep sleepers who sleep through alarms regular alarm, hard of hearing. Need to Know– This is a good alarm for people who are hard to wake. Just the vibrating alert is enough to wake most people, or you can adjust the sound level of the signal to the very loud 113dB or lower if that is too much. The clock may be a little big for some users, it has a 1.8″ display. What reviewers love about this alarm: You can adjust everything on this alarm: snooze time, alarm volume and pitch, whether you have just the warning, just the bed shaker, or both. Some users have noted that one of the best features is adjustable time on the snooze button, while others find it aesthetically pleasing. The display is straightforward to read at night even for someone that requires eyeglasses during the day. What Could be Improved: The face of the clock is a little too bright at night for some users, and there is no reset button. There are also some design issues that bother some users; in particular, the buttons for changing the alarm is on the back of the unit. It is also an excellent product for hearing impaired people or heavy sleepers, guaranteed to wake you up. CONS: The manual is very uninformative and challenging to understand. 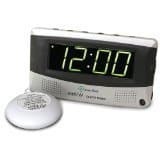 Need to Know: One of the biggest markets for vibrating alarm clocks are the hearing impaired. If you have taken your hearing aid out it is going to be difficult to hear an alarm clock so the. One of the companies that specialize in products for the hearing impaired is Clarity. This alarm has a bright light and a powerful bed shaker. What reviewers love about this alarm: Customers love that it has a variable tone and an adjustable volume in case you get used to it. The flashing light is also an essential feature for those who are hearing impaired. What could be improved: The snooze and the reset button is combined into one button, you press it once to reset and twice to get out of snooze, this seems to cause a lot of confusion for some users. The lamp is also part of the snooze/reset combo button, but it isn’t as much of a problem. Great for people with hearing loss who need an extra loud ringer as well as a light flasher. It is also good for heavy sleepers, and people who don’t want to wake others in the room. The prices for vibrating alarm clocks range from just below $20 to $70. 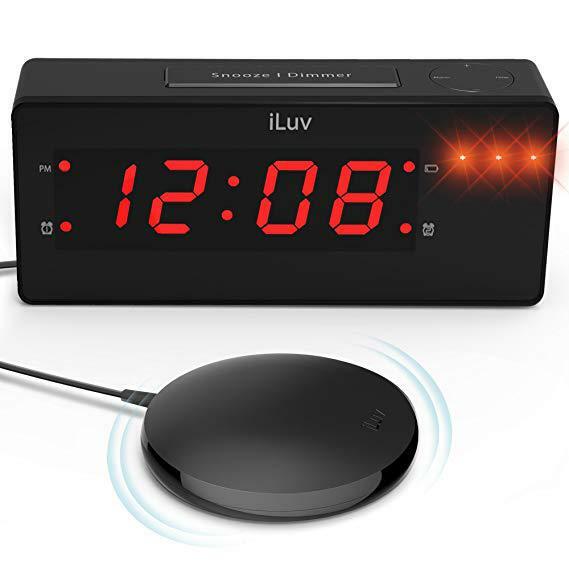 You can get a good quality basic alarm clock for around $30, but if you want extra features, you can expect to pay slightly more. You can get them at some major retailers like Walmart, Best Buy, Sears and online through Amazon or eBay, as well as directly from some manufacturers websites. As far as the best performing vibrating alarm clock, the clear choice is the Sonic Bomb with the super shaker. It is super loud has dual alarms as well as pulsating alert lights and the Super Shaker bed vibrating unit, if you cannot wake up with this alarm clock you are in big trouble. The standard warranty for most of these clocks is a one-year limited warranty as long as you return your warranty card. Standard return policies apply if you buy from a major retailer (i.e., 30-day return window). 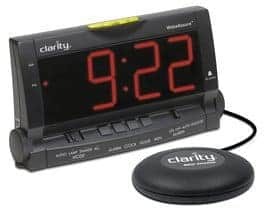 If you are someone who has a difficult time waking up to a regular alarm clock either due to hearing loss or just because you are a deep sleeper, you should give one of these vibrating alarm clocks a try. They are relatively inexpensive and have a lot of great features like extra loud ringers, bed shakers and flashing lights that can help get you up and out of bed without disturbing your partner or roommate.